Judging from player reaction to its epic 23-strong guitar line-up, Gibson has already had a stonking 2019 - even winning our NAMM best in show award for the Les Paul Standard ’50s - and its Custom Shop offerings look set to continue that momentum. 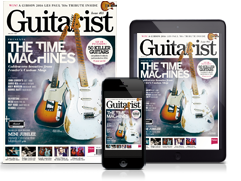 23 new guitars (what is it with Gibson and 23?) make up the much-simplified range, which sticks to recreations of models from classic years, while showcasing an all-new design, the rather dashing Les Paul Special Double Cut Figured Top. Notable spec changes across the range include the use of ebony as opposed to Gibson’s Richlite composite, while paper-in-oil caps appear as standard. There’s a solid choice of ’bursts on the appropriate LPs, too. Head on through the gallery for the spiel and prices (where available), and pop over to Gibson for more info. PRESS RELEASE: Custom Shop is proud to present the Les Paul Special Double Cut Figured Top - a mash up of several circa-1959 vintage Gibson models that looks, feels, and plays like a golden-era classic. Available in three distinct colors with more possible through Made 2 Measure custom orders. PRESS RELEASE: No specific Gibson model carries more intrigue and gravitas than the 1959 Les Paul Standard. It wasn't a successful model when it was released (under 650 were made) but before long it was adopted by some of the world's greatest guitarists - Jimmy Page, Keith Richards, Eric Clapton, Jeff Beck, Duane Allman, Mike Bloomfield, and Billy Gibbons, to name a few. All these reasons and more made the 1959 Les Paul Standard the most coveted and legendary guitar on the planet. Gibson Custom Shop's 60th Anniversary 1959 Les Paul Standard is not just a tribute to the priceless original models - it's a clone of them. From laser-scanned dimensions to chemically-recreated plastics to color-matched shades of sunburst, every element has been rendered in unbelievable detail. It represents the culmination of yearly advancements to accuracy and authenticity since Gibson Custom Shop began examining vintage Les Pauls over twenty years ago. PRESS RELEASE: The flagship model from Gibson Custom Shop, the Les Paul Custom lives up to the high standards set by its 1950s archetype while evolving to a level of tone and performance more suited to today's musical demands. Beneath the layers of its "tuxedo" appointments lies the crisp, edgy voice of a matched 490/498 humbucker set, a solid Ebony fingerboard, a long neck tenon for maximum sustain and a two-piece maple top over a solid mahogany body which adds the perfect amount of sonic bite to everything from jazz to hard rock. It sounds as good as it looks, and it looks as good as it sounds! PRESS RELEASE: The Firebird Custom retains the signature streamlined shape that makes it one of Gibson's most visually enticing guitars while adding upscale Custom appointments and powerful humbuckers for added visual and sonic punch. The Solid Mahogany construction is adorned with multi-ply binding, gold hardware, pearl inlays and a solid Ebony fingerboard. It's bold, beautiful and one hell of a fun ride. PRESS RELEASE: The classic Gibson Explorer dives into new aesthetic and sonic territory with this Custom-appointed version, replete with multi-ply binding, pearl appointments, gold hardware, and a solid Ebony fingerboard. It's an electrifying, upscale look which brings with it Gibson's signature playability, instantly-recognizable voice and Gibson Custom's unwavering commitment to building the best guitars on the planet. PRESS RELEASE: This recent Custom Shop addition takes the engine and aesthetics of the iconic Les Paul Custom and applies them to the SG platform. The result is a huge-sounding, fast-playing and classy-looking instrument that will bring out the best in any player. The solid ebony fingerboard projects chords and notes with clarity and sustain, while the 490R and 498T humbuckers compliment a wide range of sonic possibilities, from clean jazz to the heaviest distortion. PRESS RELEASE: The Flying V Custom adds upscale "Black Beauty" appointments to one of Gibson's boldest, most legendary designs. The result is guitar that exudes style and distinction -- a statement piece backed up with unparalleled Gibson tone and playability. From the solid ebony fingerboard to the split-diamond headstock inlay, it is an undeniable modern classic worthy of the "Custom" name. PRESS RELEASE: A 1960s SG has been the favorite of some of the most iconic guitarists ever...Angus Young, Tony Iommi, Robby Krieger, George Harrison, Dickey Betts, Gary Rossington, and Eric Clapton, to name a few. This Custom Shop Historic Reissue SG continues the legendary magic of the originals with all solid woods, historic hide-glue construction methods, the finest vintage replica parts and materials available and the instantly-recognizable, powerful tone of pure rock 'n roll. PRESS RELEASE: Regardless of the fact that George Harrison and Eric Clapton rocked a '64 SG Standard, that model year was clearly a standout for SGs in general. For all those reasons, Gibson Custom Shop is proud to present the newest member of the Historic Reissue family - the 1964 SG Standard Reissue. Along with the Maestro Vibrola and chunky neck profile, it has all the hyper-accurate vintage specs one could possibly want - original construction methods, a real red aniline dye finish, chemically-recreated plastics, replica electronics, and more. The result is perhaps the best looking, feeling and sounding SG Reissue yet. PRESS RELEASE: The 1968 Les Paul Custom stood apart from its 1950s predecessors in a few significant ways. Instead of a solid mahogany body, it now had a solid maple top on a mahogany back - adding the clarity and bite that many rock guitarists sought. This 1968 Les Paul Custom Reissue was designed to be the final say in historical accuracy, tone and feel. Every detail and spec was meticulously revived by the skilled artisans at Gibson Custom Shop to provide an amazing, life-long vintage ownership experience. PRESS RELEASE: The 1958 Les Paul Standard Reissue features all the painstaking historic construction methods of the famous '59 Reissues with a few historically-accurate spec differences that allow it stand on its own. Like the 1958 originals, it has narrow frets which help more of the fingerboard wood to be heard in the tone profile. It also has a round, chunky neck profile for a full feel and maximum bending leverage. And finally it has a beautiful plain maple top; each is unique and full of character. Available in a variety of classic sunburst shades. PRESS RELEASE: 1960 was the last year for the original Les Paul Standard, nearly identical to a 1959 model except for a few specs. Most notably, it features a fast-playing slim neck profile, beloved by the many famous musicians who played '60 Bursts including Eric Clapton, Joe Walsh, and Paul McCartney. It also has "reflector" Volume & Tone knobs and wider "double-ring" tuner tips. Each one is built with extreme care, reverence and attention to detail by expert Custom Shop craftspeople who are committed to providing an authentic vintage ownership experience. PRESS RELEASE: The iconic '57 Goldtop has been the tool of choice for countless guitar heroes. Its elegant gold finish, classic solid mahogany/maple construction and versatile humbucking pickups represent everything one could possibly need in a Les Paul model. Each Custom Shop Reissue is every bit the instrument and statement piece as the priceless vintage examples, providing an ownership experience that is endlessly fun. PRESS RELEASE: 1956 was the only full year in which the Les Paul model featured the powerful P-90 pickups and the adjustable ABR-1 bridge setup, a combination that allowed the Les Paul model to intonate, sustain, and thrill like never before. This Gibson Custom Shop '56 Reissue captures the look, feel and searing sound of an original 1956 Les Paul Goldtop in exhaustive detail, featuring all solid woods, vintage-accurate gold paint, authentic replica parts, Historic narrow/tall frets, and hot hide glue construction. PRESS RELEASE: Legend has it that the famous "TV Yellow" color of the Les Paul Special was named for its vivid appearance on black & white televisions in the 1950s. That's debatable. What's not up for debate is the indelible imprint this model had on music history since its inception. The classy looks and thick, meaty tones of the Les Paul Special have been preferred by players of all genres. And this 1957 Les Paul Special Reissue from Custom Shop revives every single feature in spectacular detail for the ultimate vintage ownership experience - from the solid mahogany construction to the roaring P90s. PRESS RELEASE: The Les Paul Junior and Special were revised in 1958 to have double cutaways and more fingerboard access, but the Special didn't really hit its groove until 1960, when the lower pickup placement and slim neck taper made it more robust and easier to play than ever. A pair of mean, fiery P-90s create tones ranging from sparkling cleans to crunchy distortion. Anything you throw at it, this Les Paul can handle! PRESS RELEASE: The modern player's choice! The iconic Les Paul Custom is re-imagined in this Axcess version, featuring the new Apex headstock for added strength, redesigned contours for added comfort and fingerboard access, and powerful coil-tapped humbuckers for sonic versatility and strength. But with all the added features, the Les Paul Custom Axcess is still a Custom Shop "Black Beauty" at the core, with showstopping looks thanks to its multi-ply binding, pearl appointments and gold hardware. PRESS RELEASE: The Les Paul Axcess Standard has been a favorite of professional players for years, and the latest refresh has it looking and playing better than ever. This version sees the introduction of an exciting new color, DC Rust, which is a unique stain that matches the modern appeal of the instrument itself. PRESS RELEASE: The Gibson Custom Shop 1968 Les Paul Goldtop Reissue is a meticulously-crafted replica of a "first batch" example from 1968, identified by a crown inlay on the face of the headstock. The distinctive look and scarcity of this variation makes it extremely desirable to collectors. Custom Shop has proudly recreated it in exhaustive detail, from the 14-degree headstock angle to the thick cutaway binding to the precise contours and profiles throughout. It offers not only a vintage ownership experience, but a completely inspiring sound and feel with every chord and strum. PRESS RELEASE: With its elegant lines and Ebony/Pearl/Gold aesthetic, the 1957 Les Paul Custom is easily one of the most iconic and beautiful guitars ever made. Gibson Custom Shop is proud to revive every last detail of the original "Black Beauty" for this '57 Les Paul Custom Reissue, from the dimensions to the contours to the precise inlay patterns. PRESS RELEASE: In guitar lingo, being "ruined" is when you play something so good, there's no going back to what you once had. No Gibson guitar has evoked this expression more than the Les Paul Junior. In the 1950s it was sold as a student/budget model - as simple as a set-neck electric guitar could be. But after a while, the humble Les Paul Junior caught the ear of professional guitarists who appreciated its sonic purity and minimalist components. Gibson Custom Shop has proudly kept the recipe the same for this Historic Reissue. From the solid mahogany and hide glue construction to the vintage-style wiring, the classic Les Paul Junior is back... and ready to "ruin" you. PRESS RELEASE: 1958 was a monumental year for Gibson in which a whole new lineup of now-famous models were introduced. One of them was the redesigned "double cutaway" Les Paul Junior, which has since found its place in music history as a favorite of hard rock musicians. The extra fret access of the double-cut construction allows upper octave leads while the "simple is better" single-pickup setup projects only thick, heavy tone. Gibson Custom Shop has proudly revived the original recipe from 1958 for this Historic Reissue, from the solid mahogany and hide glue construction to the vintage-style wiring. It is an accurate and faithful replica in every possible way. This version features a standard stop bar tailpiece and an eye-popping figured maple top, finished in Bengal Burst to bring out every nuance of the maple.